We are about to enter the last week of Advent. We are making the final preparations in our hearts to welcome Christ and celebrate His birth. One way that we can do that is to pray the “O Antiphons,” and they start today (Dec. 17th). The “O Antiphons” are really prayers for Jesus to come in our lives. There are seven antiphons, each calling on a different name of our Messiah; and we pray one per day from Dec. 17th to Dec. 23rd. You could pray them with Evening Prayer, as is the tradition. Or, if you have little ones, you could simply say the antiphon before bed each night, sing the corresponding verse from O Come, O Come Emmanuel, and read the Bible verse that mentions that name. Pray them in a way that flows naturally with your family’s prayer life. Isaiah 33:22: “For the Lord is our judge, the Lord is our ruler, the Lord is our king; he will save us. We plan to start the tradition of praying these antiphons as a family this year. Our children are little, and I have found that having something tactile or sensory to pair with a prayer or religious ritual helps them understand the meaning and get “into” it. So this year I’m finishing up some O Antiphon ornaments for us to hang each night after we pray, read, and sing. I will be posting them each day on Instagram. (You can follow me at jessica.ptomey.) 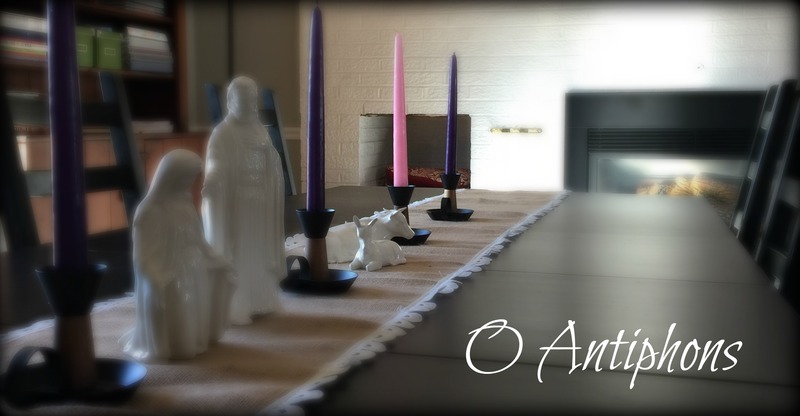 If you are on social media, I encourage you to post your O Antiphons tradition using the hashtag #OAntiphons.